The first concentration camps in Germany were established soon after Hitler's appointment as chancellor in January 1933. The Storm Troopers (SA) and the police established concentration camps to handle the masses of people arrested as alleged political opponents of the regime. These camps were established on the local level throughout Germany. 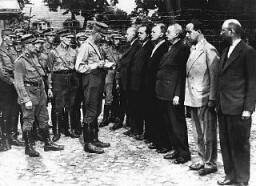 Gradually, most of these early camps were disbanded and replaced by centrally organized concentration camps under the exclusive jurisdiction of the SS (Schutzstaffel; the elite guard of the Nazi state). By 1939, seven large concentration camps had been established. Besides Dachau, they were Sachsenhausen (1936) north of Berlin, Buchenwald (1937) near Weimar, Neuengamme (1938) near Hamburg, Flossenbürg (1938), Mauthausen (1938), and Ravensbrück (1939).